and so educators must learn to peak their student’s interest and alter their teaching technique that is best suited for the current trend in learning but at the same time still be in accordance to the school’s standards. 59 percent of students use mobile phones to study, while 93 percent of them use their Smartphone to access study apps, so why not start adopting a few changes in your teaching strategies? 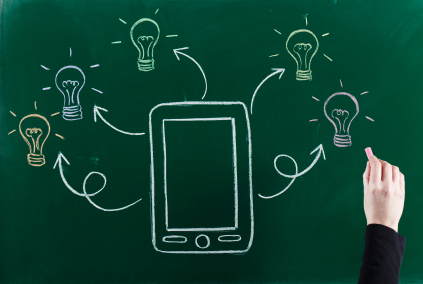 Encourage your students to use of their gadgets in class to boost their learning productivity. Involving these medium for learning will help them utilize and optimize their usage other than just for social media and communication purposes. DropBox: Free online back-up storage you can use to save your documents, presentations, photos and other files. Compatible with iOS and Android devices. To facilitate file sharing with ease; everyone needs to create their own unique user ID then share notes, review materials and even homework to your students online. All the stored resources can be accessed online and through any device as long as you logged in using your ID and by adding files in the “Favorite” labeled folder, saved files can still be accessed even when offline. Haiku Deck: Presentation software that’s simple, beautiful, and fun. Works for all types of presentations including enliven a to-do list, tell a story with words and pictures, and summarize a discussion. Create a stunning visual presentation using your iPad. Making visuals for your presentation can be a breeze. Choose from a wide selection of elegantly designed background slide themes, fonts and color palettes and share your presentation on social media platforms such as Twitter and Facebook. You should also develop your student’s visual literacy by making them a critical viewer of the media. A must have app for very classroom where every member of can create their own profile very similar to Facebook. It is especially designed to promote teacher-student engagement. Sharing resources and connecting with the respective instructors is made easier and seizing each student’s performance can be done in real-time. Teacher Kit. Be future forward and go mobile with this free app previously known as the “TeacherPal” app. Available for iOS and Android. Start being techie and organized. Move on from the old-school class records and use this app for creating class lists, taking attendance, entering grades, managing student data, keeping seating charts, monitoring student behavior in class and more. Seeking for the right mix of strategy in choosing the teaching platform you want take can be a bit tricky! So knowing your students well can be a great help in planning how to go about your lessons. Try the ideas above or share something that worked for you.